System to adjust the straight parts from guidings. We have a complete range of chain conveyors available. We have a complete range of flat belt conveyors available. Roller conveyor suitable for transport of pallets in both directions. Can be integrated in delta packing machines to obtain a fully automatic line. Conveyor to transfer products from one conveyor to another. 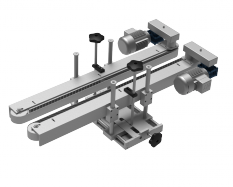 Our flat belt conveyors of 200mm wide are also available with vacuum. Compact, fully automatic machine to pack bottles into bags automatically. Width adjustable 350–550mm / 400–600mm / 500–800mm, length adjustable 200-600mm. Pharma bagger. Optionally we can make hermetically bags. Optionally with shrinking tunnel (better stability and manipulation of the bags). Width adjustable 600-900mm / 800-1000mm, length adjustable 200-700mm. Unit used a lot in cosmetic environments. Width adjustable 800-1200mm, length adjustable 200-1200mm, product height 50-300mm.